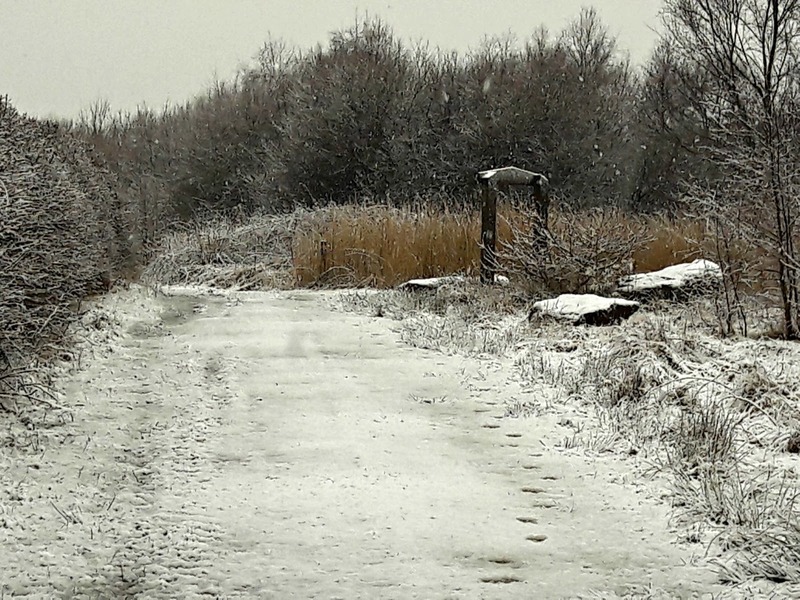 It was very wet underfoot and although it snowed for most of the morning, it had started to disappear by the early afternoon. Nice whilst it lasted, though! 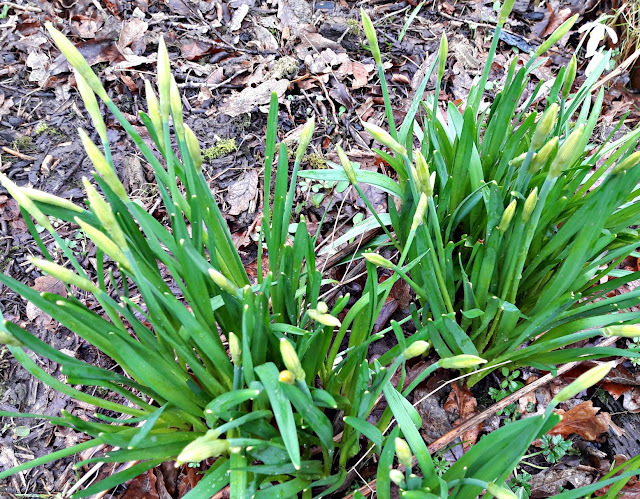 By Saturday, the temperature had risen quite considerably and I spent a happy few hours out in the garden doing some tidying up. Most of the plants are quite overgrown so I've been pretty ruthless in cutting them back to let the light in and also to take a view of what I want to do with the garden this year. It's got to that stage where I need to take a serious look at the borders and see what's going on as they're not the same as when I first planted them. This always happens, of course; some plants live, some die, some try to take over the whole garden, others try to knock the sun out of the sky by growing much taller than you'd expected. It's all part of the fun of gardening and I'm looking forward to sowing seeds and putting some new plants in this year. 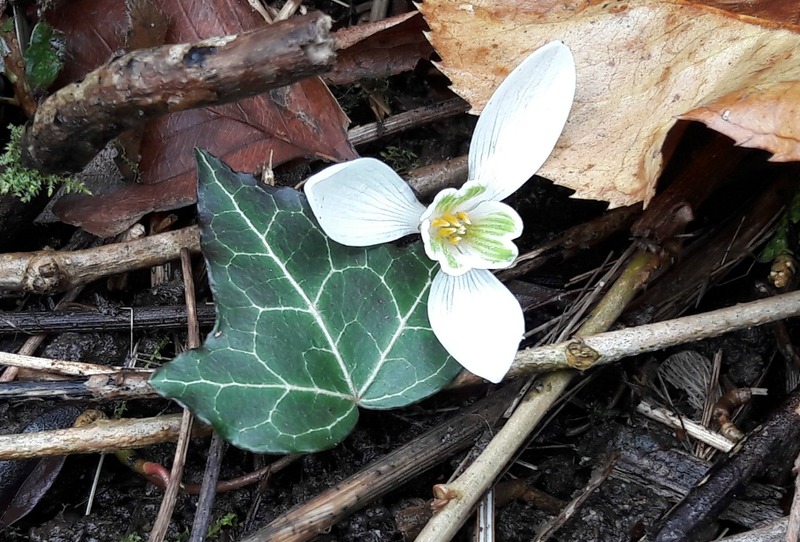 We have so many snowdrops this year, it's wonderful! I spent some time a couple of years ago transplanting some of the bulbs from this huge clump around the garden and now we've got patches of snowdrops everywhere. 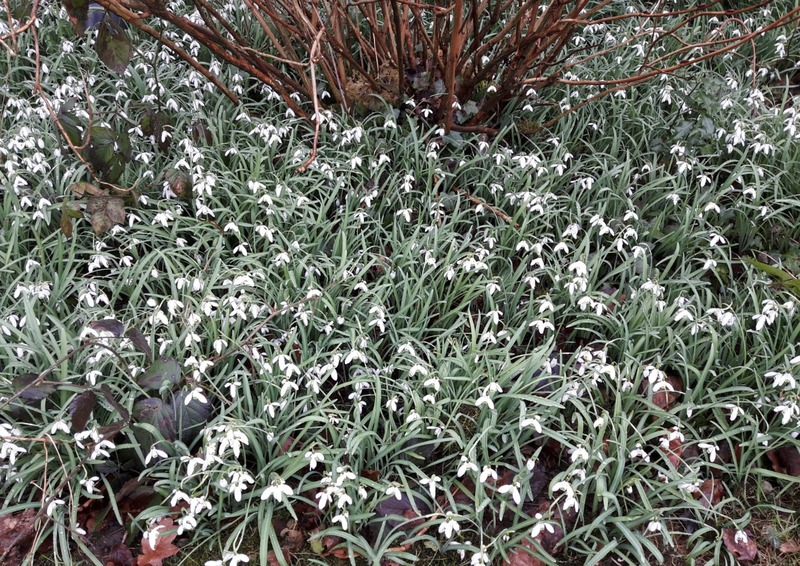 This clump hasn't shown any ill-effects as there seem to be more snowdrops than ever! You don't normally get to see what they look like under their drooping heads but this one got knocked over so I photographed it so that you could see. Isn't it pretty? It stood up again once I'd moved the cuttings that had squashed it, so don't worry! 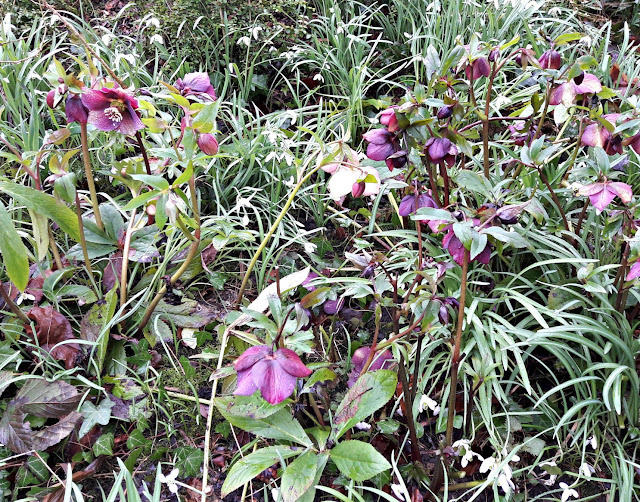 I love Hellebores and have a few different varieties in the garden. These are Helleborus orientalis or Lenten Rose. and this little one by our front door is flowering already ... I think it might be a Tete-a-Tete daffodil but couldn't tell you for sure. 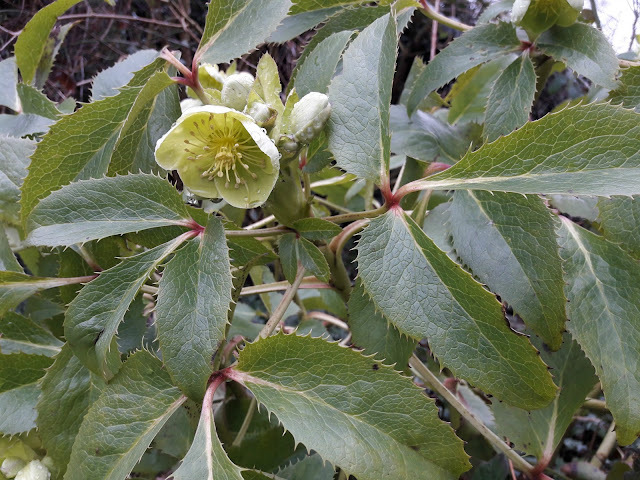 Another Hellebore - this is Helleborus argutifolius or Corsican Hellebore; it's huge compared to the others and I love it with it's sharp-toothed leaves and pale green flowers. I think it was the first plant I ever saw with green flowers and it has always fascinated me. 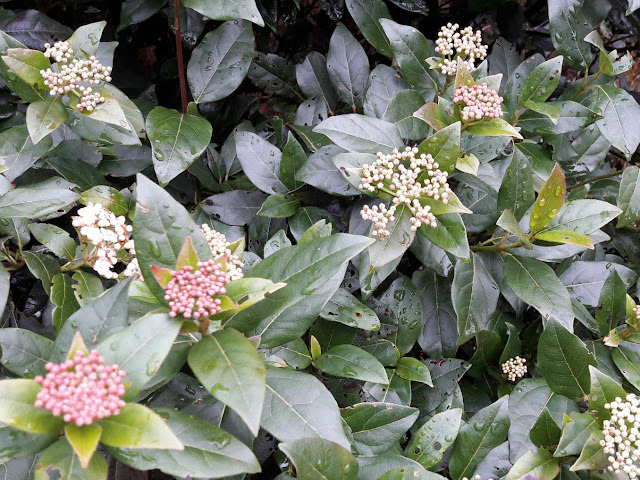 Even the Viburnum tinus is starting to flower so I'm sure the plants must have been wondering what the weather was doing last week when it started to snow! I do like a good fire when I'm outside; not everything will go through my shredder and there's a limit to how much I can get in the green waste bin too. Typically, for the few hours it was dry the fire wouldn't get going no matter how much kindling and newspaper I tried to start with it, but as soon as it started to rain and I wanted to go indoors, the flames blazed up and the fire was just right for getting rid of all those twigs that had been making the place look untidy. 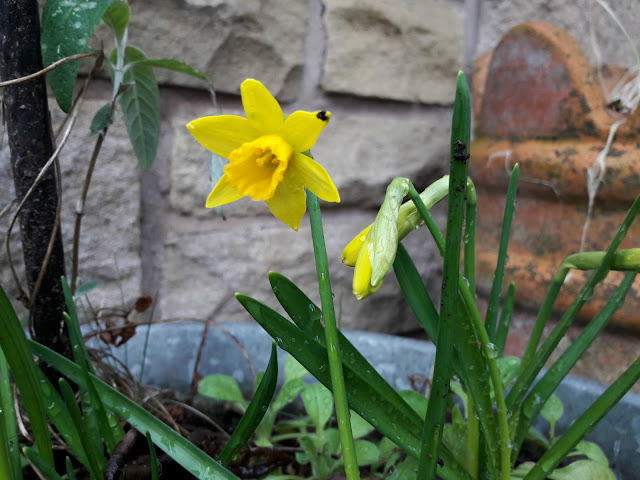 I stood by my fire in the rain and told myself that I am not a fair weather gardener and I don't dissolve if I get wet, and wondered if I needed to go and get a waterproof coat. 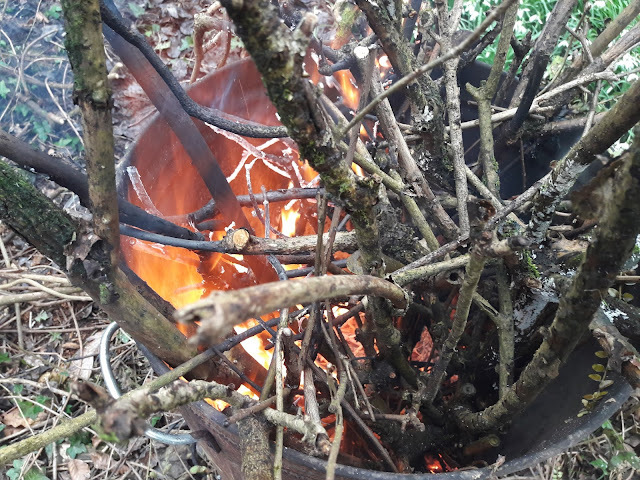 Luckily, the rain didn't last for too long and the twigs burnt quickly so I took myself back indoors, very happy with what I'd been able to do. 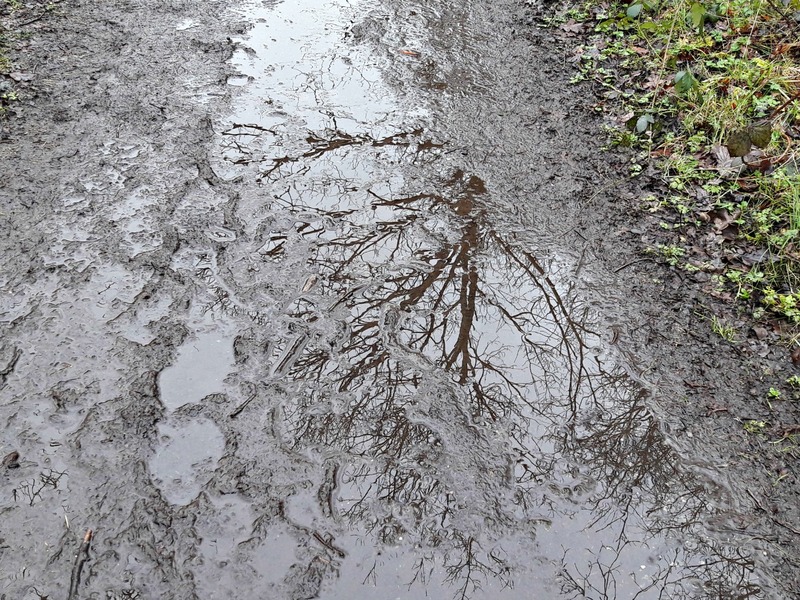 You can see the result of the rain that we've had since the weekend on today's walk. We were back in Culcheth at the Linear Park (I told you I like to keep the dog on his toes!) 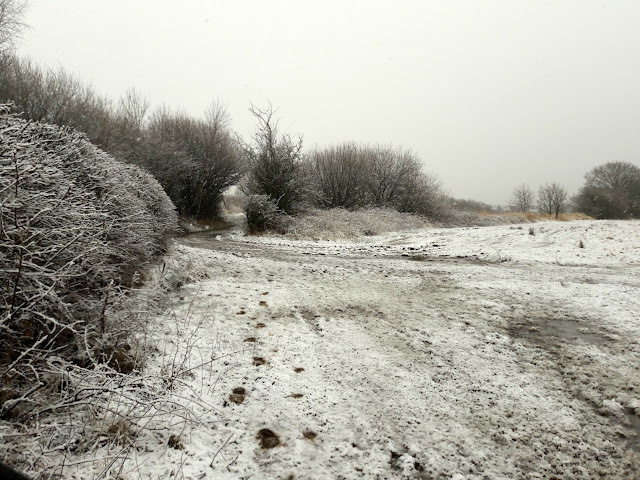 and the path was really muddy in places. I like being able to see the reflection of the trees, it's one of the good things about puddles! 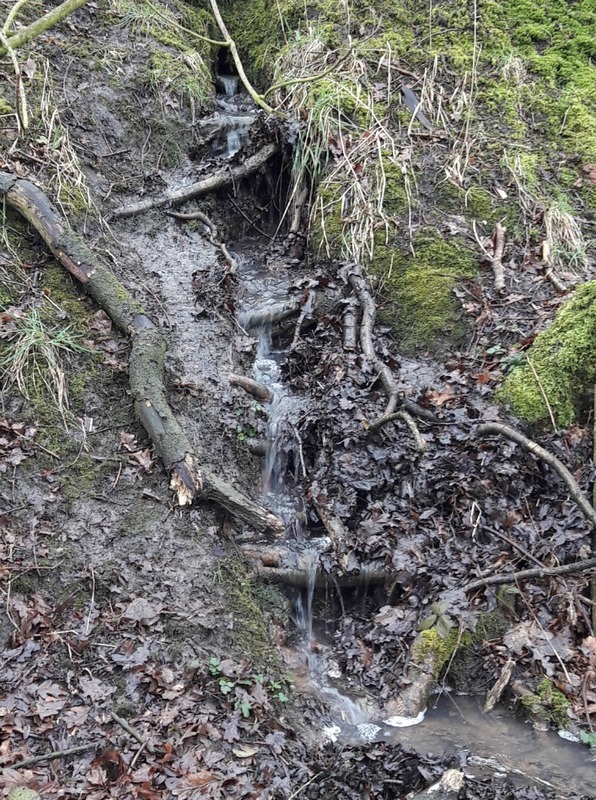 I like these little waterfalls too, created by water run-off from the farmers' fields above the footpath. They'll be dry again once the rain stops, those tree roots looking like little ladders in the bank. Who doesn't love a gate, even one that's broken? I do. It must speak to the explorers in us who want to know where it leads to, and whether it's an invitation or a defence. 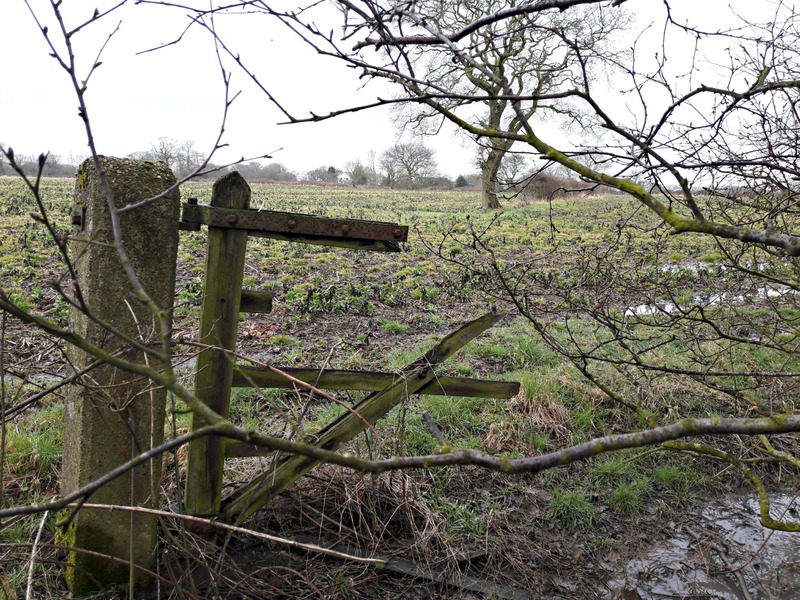 This is an odd place for a gate as there's nowhere for it to lead to; it's on the edge of a field with a steep bank on one side and the field on the other which is probably why it's been left to disintegrate, but it must have been used once. I wonder what it kept in - or out? Beautiful photographs of the flowers, Christine. Thank you for sharing them. You have a fabulous collection of hellebores and lots of pretty spring blooms to remind you spring is jut around the corner. This reminds me of my old garden which had many of the same plants in it. This year I'm determined to make an impact on the 'new' garden which is about 10 (or more) times the size of the old one. Love the story and the photos. I can sympathise with the dog walking through the mud. Love the snowdrops! So many! Such a hopeful sign! 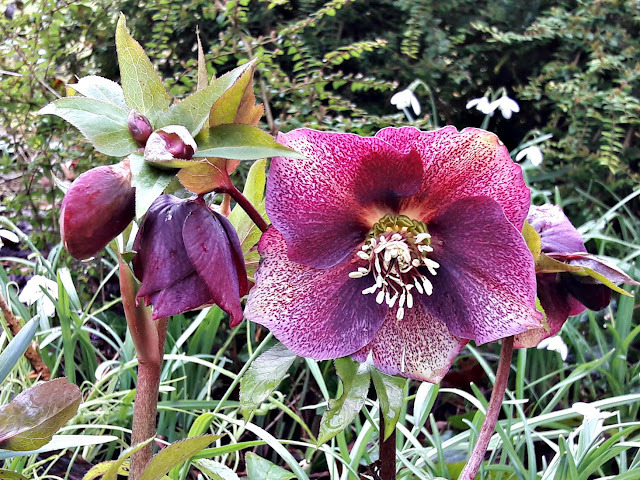 Hellebores, so exotic for at such a dull time of year, I love them.